I’m in disbelief that I’m past the halfway point of my fellowship and now displaced yet again in a completely new and different environment. In a tiny town in the hills neighboring Tainan, at Tainan National University of the Arts, my eyelids feel heavy and half asleep. I’ve just arrived two days ago, but the anticipation of change had left me sleepless days before. I realize I don’t do so well with change -- I crave routine and the soft comfort of a familiar bed. I’m not so sure what my days will look like here. Although isolated in the mountains, I am integrated into a community of students and teachers here. In Taipei, I felt strangely more alone in the city, alone in my research, but I grew to appreciate that solitary walk. Here, I am met with questions that I have not yet found the answers too, and these questions are really quite simple: why are you here? I was expecting to reach clarity earlier during my fellowship, but I haven’t yet. 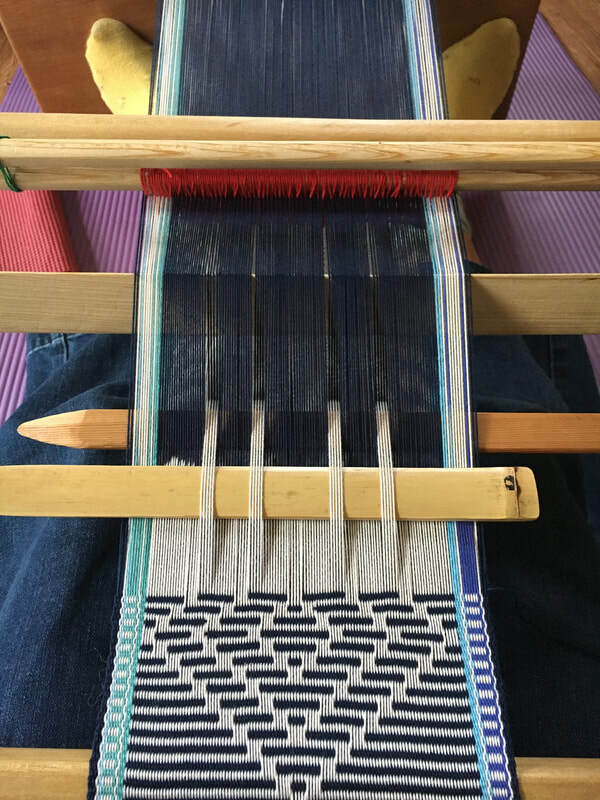 Sure, I came to study Atayal weaving techniques and patterns, and now that I have, what will I do with that knowledge? According to the grant proposal I’ve written over a year ago, I should be focused on creating a body of work that is reflective of my time with the Atayal. And although I left it purposefully vague, I’m daunted by what comes next. I find that that is a continual source of anxiety for me -- the unknown future, but still I lean towards the unknown, towards unplanned possibility. 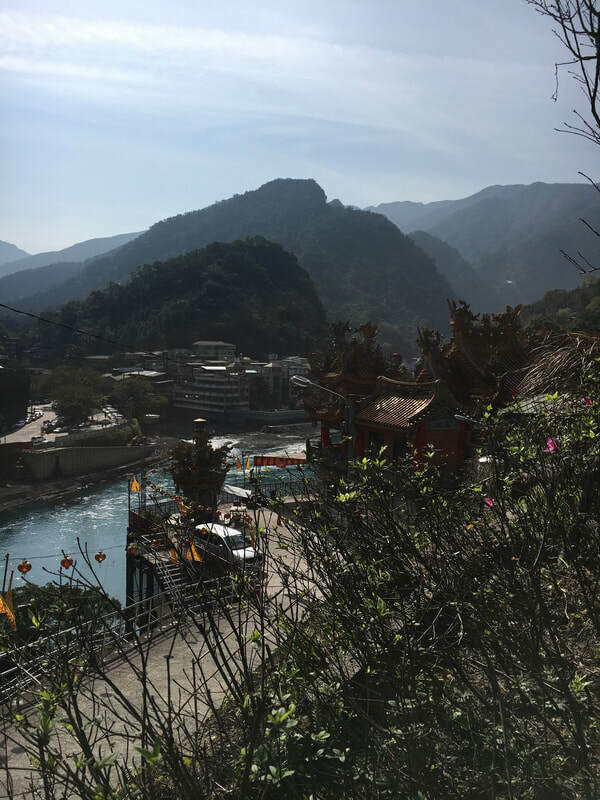 A part of me feels out of place as a Taiwanese-American, presumedly of Han descent, relearning the culture of the indigenous Taiwanese; it feels like appropriation. And in reality, I do not envision myself making work about the symbolism in the patterns I have learned, nor is my interest specifically in the technique, but rather I find my passion is in the act of weaving itself -- how it transcends so many different cultures, and can provide a sense of identity and empowerment. What really drew me to indigenous Taiwanese weaving was the revival that it is currently undergoing, this reclaiming of what was lost. Likewise, by coming to Taiwan, I am trying to rediscover what I was unable to find in the States, my sense of belonging. I think I’ve always known that this would be a futile search, that my identity would not come to me in a sudden epiphany, but rather the accumulation of each day would slowly reveal to me my place in this world. The sun is so bright here in Tainan. It is in stark contrast to the gray clouds that hover over Taipei this time of year. It is warm and the change is quite nice, but the humidity still remains, permeating my new bedroom with the smell of mildew. I’m still getting accustomed to my new environment, but am feeling thankful for the friendly helpers along the way. Yesterday, a professor in fibers invited me to a family outing with her husband and her young son. We wound up far into the mountains of Alishan, the tallest range in Taiwan, where many tea plantations grow along its steep mountainsides. It was magically misty up there, and I felt immensely grateful for all of this. This same teacher revealed to me the different art spheres of Taiwan, divided between the north, Taipei, and the south, Tainan. She explained to me, in Taipei, the priorities are different -- art students are taught how to maneuver the art world, to gain exposure, whereas here, in Tainan, where the pace of life is much slower, art students are encouraged to look into the local, as opposed to the international, to learn about themselves and their communities. Hearing this, I realize I’m in the right place. I’m aware of how this artwork rooted in family history can seem to an outsider -- totally irrelevant and self-absorbed. Yet I find I can’t talk about the pressing issues of our society without beginning from the most basic unit -- the individual. Talking to the professor who invited me to the university a year and a half ago, she asked me why I haven’t looked into my ancestry yet, that there are well-organized records of all the residents compiled during the Japanese Occupation of the island. I’m not sure what’s keeping me from doing so; maybe I’m still unsure of what use that specificity serves. Would it place me somewhere, provide a kind of grounding that I have always craved yet also resisted? And instead, do I insist on this ground of goo goo? I don’t know what comes next. That feels shameful to admit out loud, but truthfully, I’m just feeling it out. Much like my artwork, nothing feels certain until it has been excessively worked through my hands, so it is with this experience. The view of the river that runs through Wulai taken on the last day of class with Atayal weaver, Sayun. Practicing the reversible pick-up technique. Sayun shows me a new pick-up technique that creates images on both sides of the cloth. 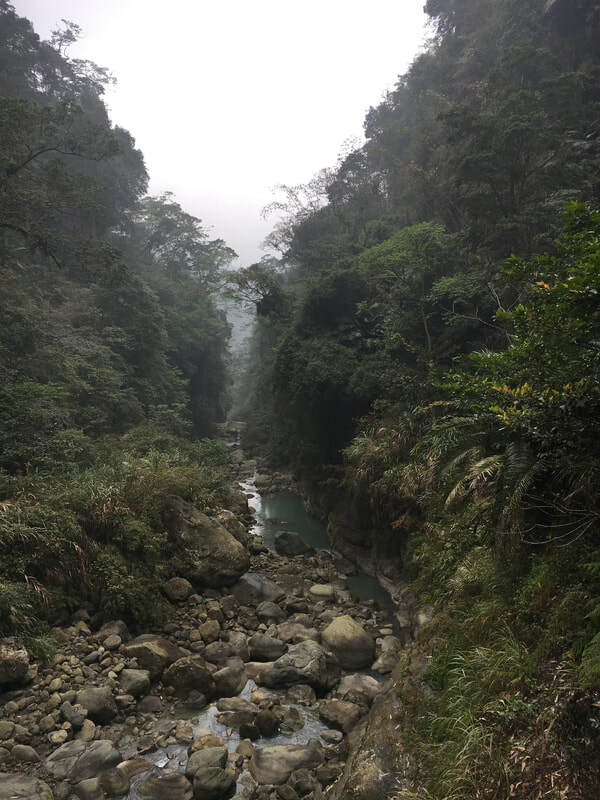 Artist and teacher, Pei-sun Wu, and her family takes me on a hike through a valley in Alishan. 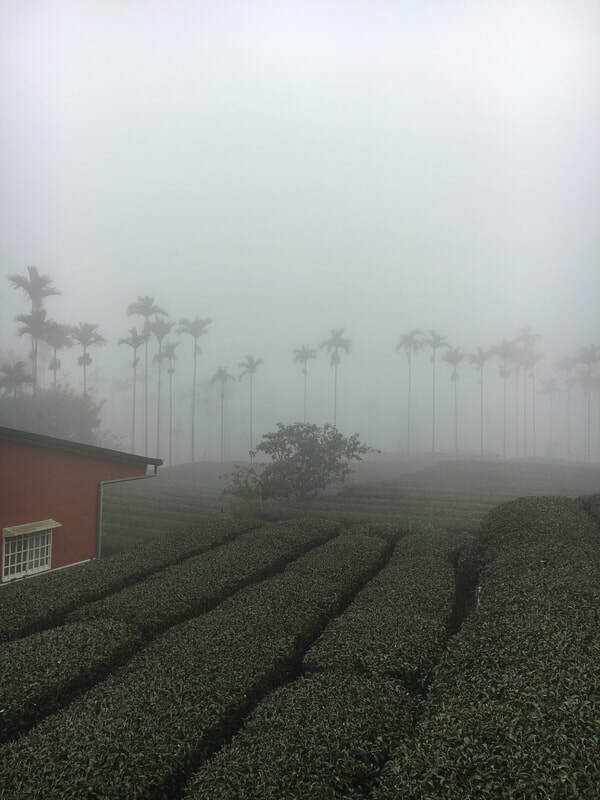 A tea plantation at the entrance of the trail at Alishan.